These charming glass milk bottles will add a vintage tone to your event tables. 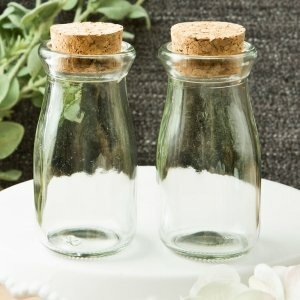 From our Perfectly Plain Collection, these charming milk bottles are made from glass and have a round fitted cork top. The bottle can hold about 3 1/2 ounces of liquid. Fill the bottles with spices, bath salts, spices, chocolates or candy treats. Place a hand written message inside and you have a fabulous and unique favor for your special event! is the cork secure enough to hold liquids even if bottle is laid flat sideways? The Perfectly Plain Collection Vintage Glass Milk Bottle has a round fitted cork top which can definitely secure a liquid but should not be laid flat sideways. Handwashing is recommended for this Perfectly Plain Collection Vintage Glass Milk Bottle. I'm wondering if the milk bottle containers will fit inside of a coozy? Yes, they would fit. The Perfectly Plain Collection Vintage Glass Milk Bottles are approximatly 4" x 2". Can you please give me the size of the opening on the Perfectly Plain Collection Vintage Glass Milk Bottle? Approximately 1 2/16". Since it concaves like a cone so it's hard to get the exact measurement inside the bottle. How many candy kisses does this Perfectly Plain Collection Vintage Glass Milk Bottle hold? I'm sorry, we do not have that information. But, our best guess would be approximately 5 - 8.